The original version of this page was one of my first web pages, last updated in 1998. Instead of updating the page, I decided to start a new one and keep the original page around for reference. I chose to keep the original squirrel background tile, to maintain the "antique web site" look of the original page. The background tile is derived from this picture of a cute little red squirrel from Michigan. The name "Thryomanes" refers to a little bird called the Bewick's Wren (Thryomanes bewickii). The pronunciation as I've heard it (on bird song recordings) is approximately "thry-OM-a-neez". Hear the song of a Bewick's Wren recorded in Austin, Texas. For the most up to date information about squirrels (and a million other subjects), check Wikipedia. As of June 2006, Google shows 27.6 million hits for the word "squirrel". Many of these links, on the other hand, don't have much to do with actual squirrels, but with things like SQL clients and programming languages. The Latin name Sciurus returns 787,000 hits, but not even all of these are squirrel links. 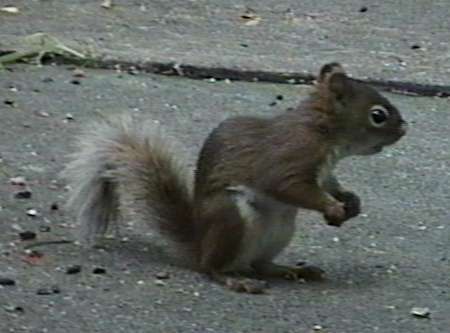 The name of the squirrel family, Sciuridae, gets 258,000 hits. Even doing a Google image search for large full-color JPG files gets 13,500 hits, which is a lot of squirrel pictures (with a lot of non-squirrel pictures mixed in). When I started this page, a search for "squirrel" turned up a few hundred pages at most, but these days, there are far too many pages to check out even a tiny portion of them. There are two ways to sift through this vast sea of links. One is to narrow down the search: from "squirrel" (27.6M) to "red squirrel" (856,000) to "red squirrel" +michigan (35,200). Another is to look up the word for "squirrel" in a random dictionary, such as Italian (scoiattolo, 510,000 hits) or Portuguese (esquilo, 562,000 hits). The problem with that is that not enough dictionaries have a word for "squirrel" listed. One way to find words for "squirrel" is to use Google Advanced Search, type a Latin name in the search box, and select a language from the language box. For instance, Google returns 900 pages in Polish for the word Sciurus, from which you can find that "wiewiórka" seems to be a Polish word for a kind of squirrel. (It also is apparently a Polish surname.) Another is to visit the English Wikipedia "Squirrel" page and click one of the links in the box marked "in other languages". Links from the original squirrel page that are still around after all these years.